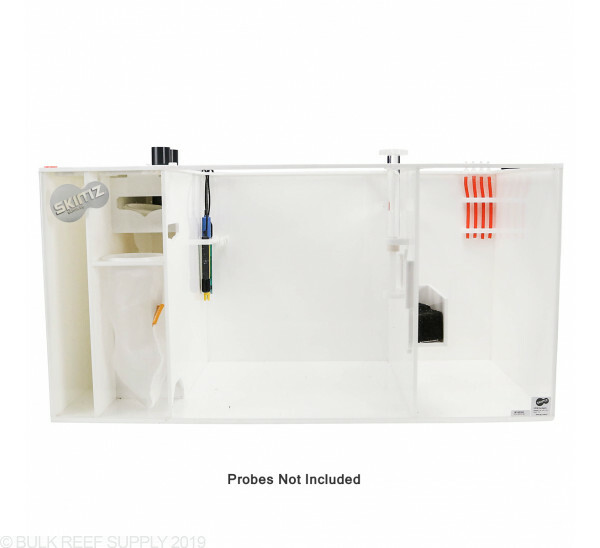 Sumps are a great addition to any fresh or saltwater tank. From adding additional water volume to area for heaters, reactors, probes, and any other life support equipment you may want to add. Many tanks are already drilled or can be drilled for a sump to be added. 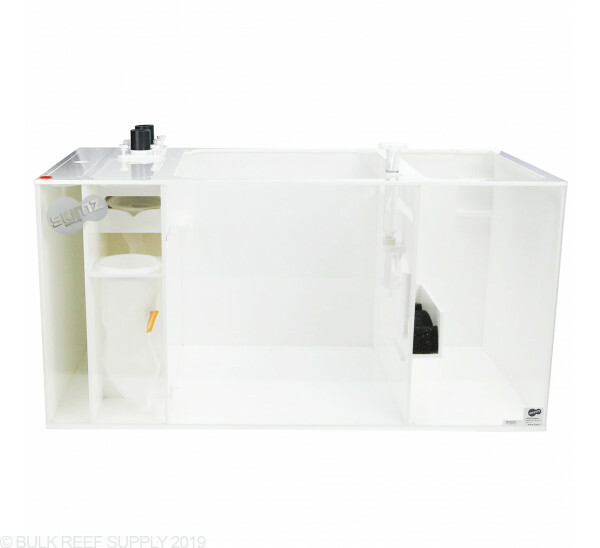 Skimz Sumps are by far one of the best sumps for the money and packed with features all reefers will value. Select Skimz models even include and integrated top-off chamber to house freshwater, just add an ATO unit and your set. 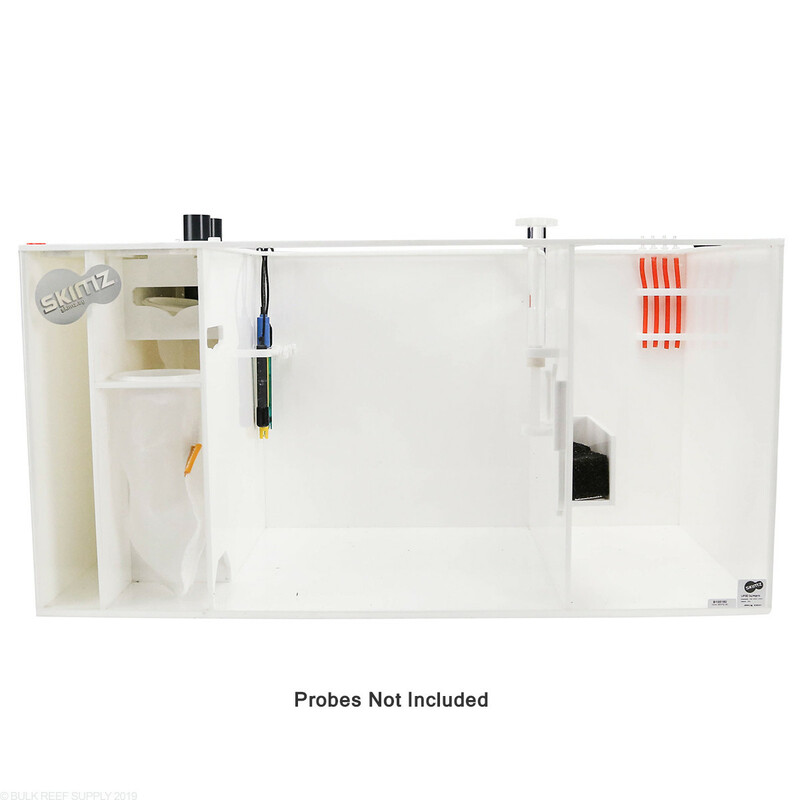 The compartment that is dedicated for fresh top off water even includes a perfectly fitting lid that includes notches allowing the ATO's power cord and tubing to sneak through without modification. The sump is extremely noisy due to its design. 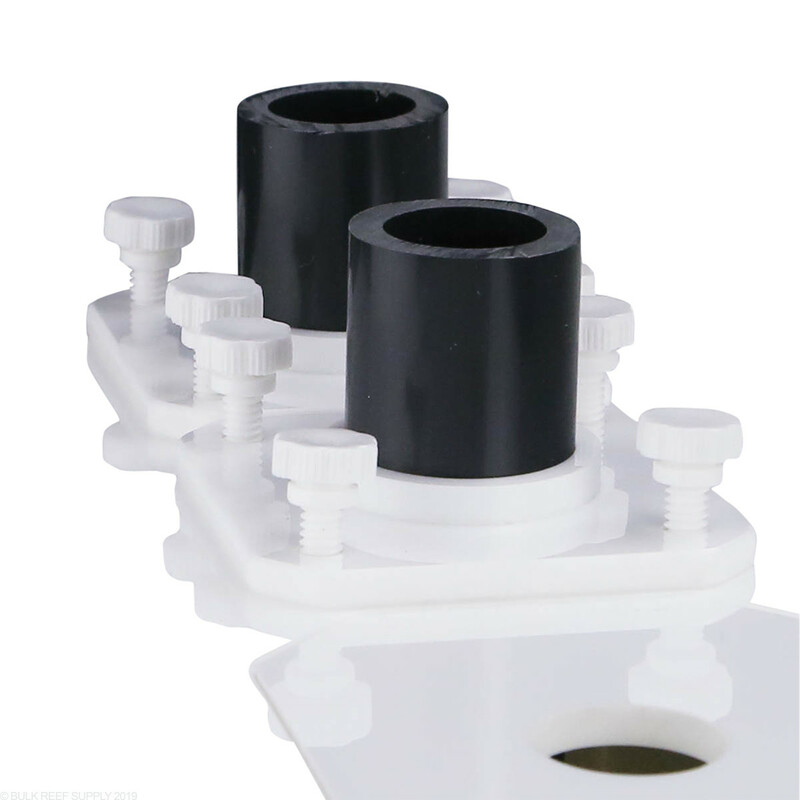 Because of the cascading filter chamber design, the water flow from the first filter sock chamber to the second filter sock chamber has always a loud trickling sound . In addition to that, there is an air space located in the second filter sock chamber that adds to the overall noise which is more of a swallowing sound ... It is more like water falling down to a hole/tunnel. Since I have gate values on all my plumbing, I tried to lower the flow/drain from my main tank to the sump however the sound only reduced when my drain was about 95% closed! Meaning almost no water was going down to the sump. Another issue is the noise of the water flowing from the skimmer chamber to the return pump chamber. Another trickling/falling sound! In order to minimize this sound, you need to more or less have the same water level in the skimmer chamber and the return pump level so the water will just flow to the return chamber smoothly without falling to the next chamber. Both the lids of the fresh water chamber and the filter sock chamber also warped within 1 week of usage. I am crossing my fingers that the no other parts of the sump will warp and cause a leak. 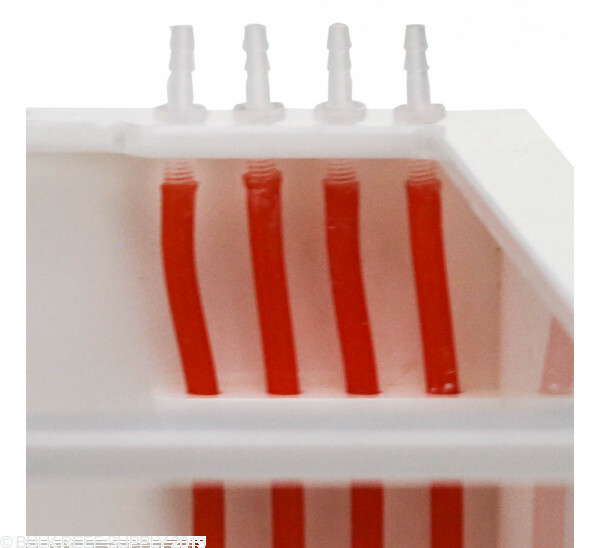 The skimmer chamber height adjustment is convenient. No more plastic stands to match the height requirement of your skimmer. 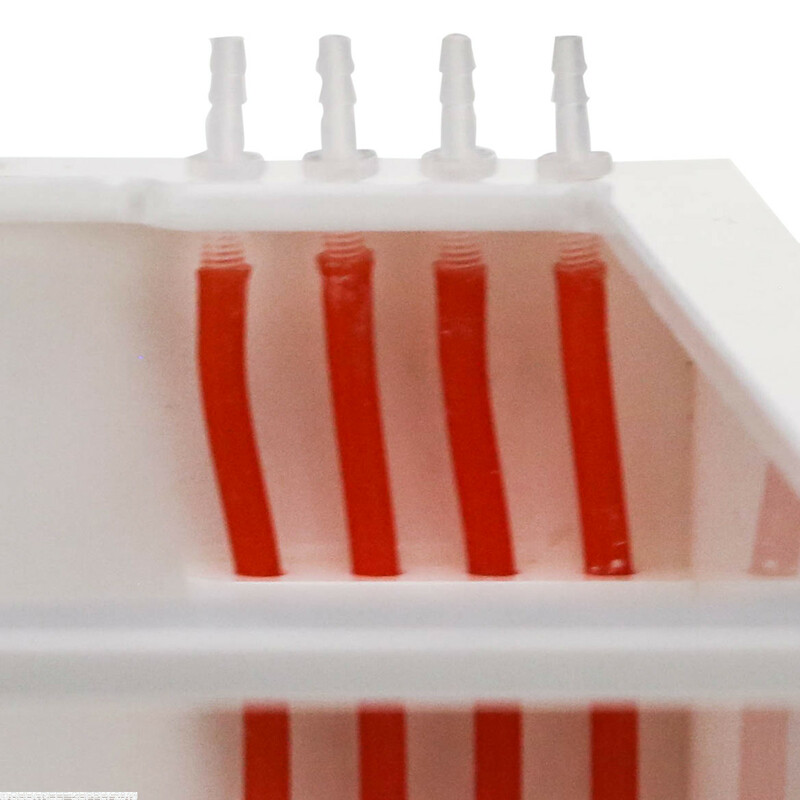 In addition, skimmer chamber will fit most skimmers that has a bigger that normal footprint. The probe holders and the dosing tube holders that are built is also nice to have. I would not recommend this product to anyone. 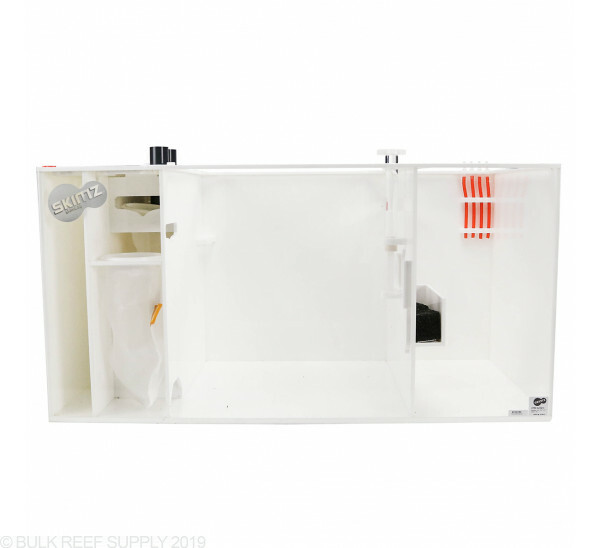 Although the SKIMZ Sump Pro 30 has some built in features that are equivalent to the higher priced sumps, the noise level is definitely a huge disadvantage and most of all annoying and not worth the hassle. I have a 60 gal mixed tank and my old sump that came with the tank was rather cheaply built and started to bow out. 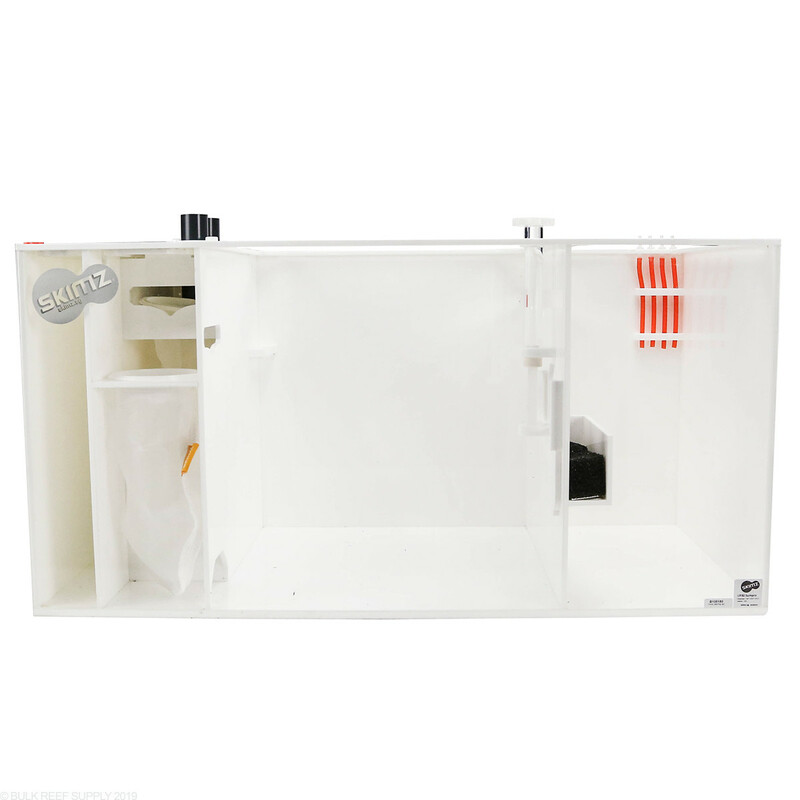 I wanted to get a new sump before a needed to build an arc in my living room when it leaked so I bought the Skimz UP30 from BRS with great happiness on all aspects from customer service to the product. My first sump was used as a bouncy ball by UPS I think and was cracked, but BRS had me a new sump right away. The sump is spacious and is super easy to adjust with the Level-o-Matic adjustment knob. One issue I had, but maybe my own fault for inexperience, the directions show the drain from the tank going straight down into the sump tube, but with that set-up I was getting massive burping sounds form the air that gets trapped being released. After realizing this and trying to adjust the flow on my DC return pump to try and correct it, the flow was too low when the noise actually started to get quiet enough to accept. I re-plumbed the drain to have a couple bends in it to cushion the water falling and give a little bit of back pressure for the water to 'stall' and not make the burping noise as before. Once plumbing was done, it is pretty quiet and was able to adjust the return pump to an appropriate flow for the tank. Awesome construction, easy adjustments, and nice look. The best built sump for the money. It's more solid than the Trigger sumps and more stunning. I like how there's no refugium as I don't need one. It allows more room for a large skimmer. There are only two critiques I would give. One, the filter socks are smaller than the industry standard. I wouldn't say the BRS filter socks don't fit, nor would I say they do. It takes some negotiation and will never be perfect, but no big deal. Secondly, there is an ATO compartment that is useless and takes up space. Two gallons would only last a few days. They could have used that space for a better bubble trap between the skimmer and return sections, which is just okay. 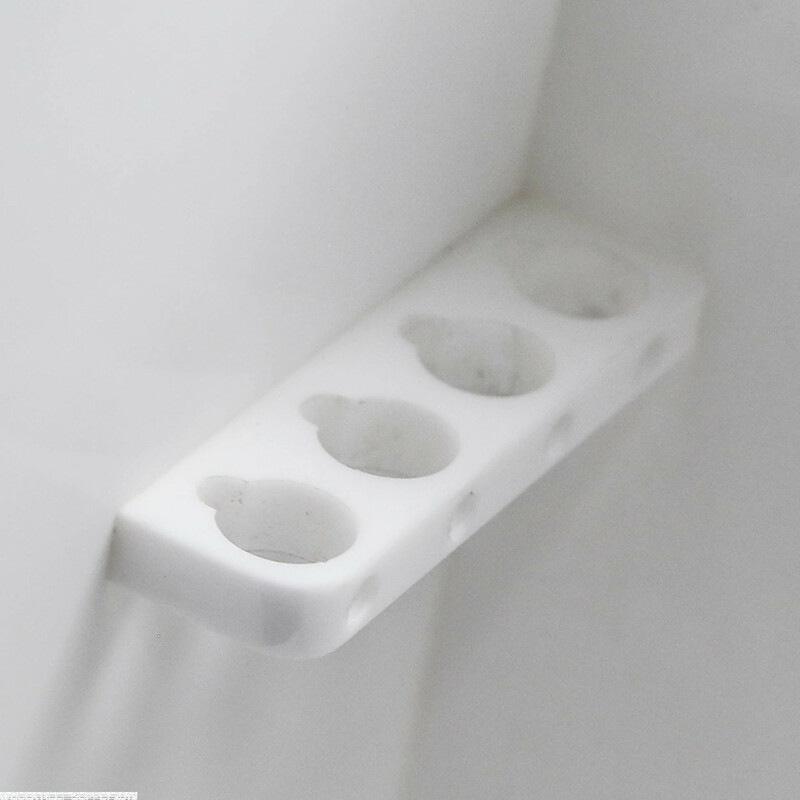 Also, there are two small holes between the ATO compartment and the sock compartment that allow water to enter the ATO from condensation and splashing. When not using the ATO compartment, it's a pain to clean out. I ended up filling the holes, which solved the issue. Never the less, a solid buy and a better value than the Trigger sumps. I really like how water overflows adjacent to the socks before going into them. What is the wall thickness on the Skimz sumps? The acrylic on this sump is 3/8" thick. Can this sump be drilled for a bulkhead to an external pump? Is there a special bit? 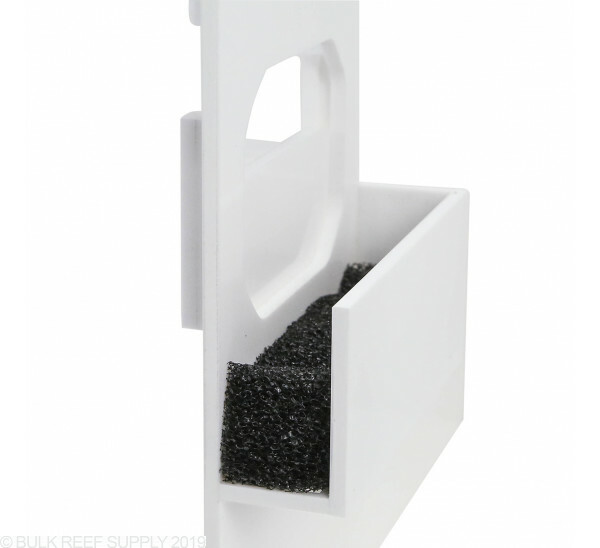 The UP30 is an acrylic sump and can easily be drilled for an external pump if need be. You will want to use a fine-tooth drill bit such as these https://www.bulkreefsupply.com/16-piece-hole-saw-drill-bit-set.html rather than an abrasive glass drill bit. You can use the sump with a 120-gallon aquarium, but it may be a little small to handle some of the filtration components. If you are thinking of upgrading we suggest making a quick parts list to see if you may need a larger skimmer than your current or a larger pump possibly? 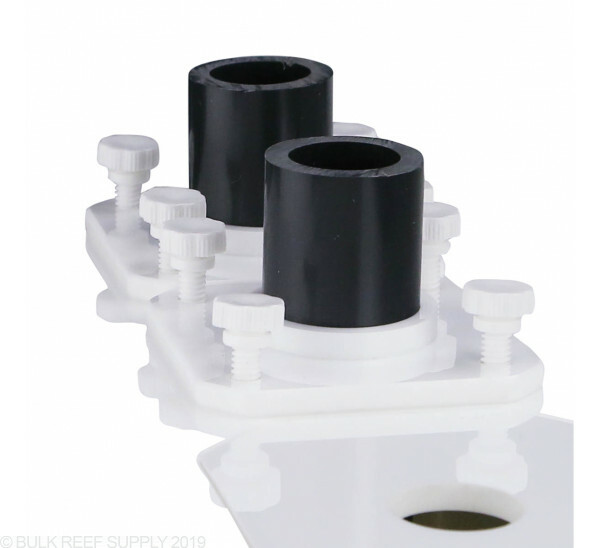 When it comes to tank size for sumps there are recommendations to make sure your sump has 10% - 20% of your total systems water volume but that is a recommendation. The best answer is to get the biggest sump that will fit into your stand.